Good Saturday morning. It's Day 191. White House Chief of Staff Reince Priebus told me last weekend that the arrival of Anthony "Mooch" Scaramucci as communications director would mean "a fresh start" for the West Wing. This wasn't what he had in mind. 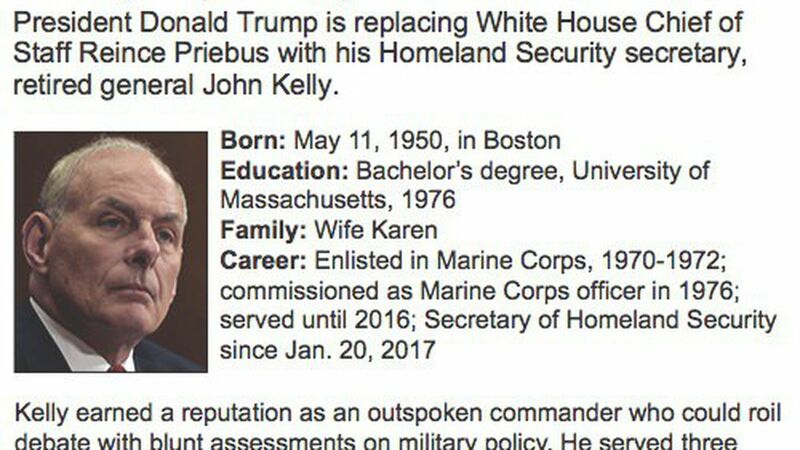 Landing in the rain at Andrews Air Force Base, Trump tweeted at 4:49 p.m. yesterday that his new chief of staff would be his Homeland Security secretary, retired Marine Gen. John Kelly, age 67: "He is a Great American ... and a Great Leader. ... He has been a true star of my Administration." "Trump is casting his show. Generals are all-purpose actors in a supporting role." WashPost lead story: "Trump had long questioned the depth of Priebus' loyalty, often remarking about how ... Priebus encouraged Trump to drop out of the presidential race after [the 'Access Hollywood' tape]. The senior official described Priebus' counsel that day as 'a stain he was never going to remove. The scarlet 'A.H.'" "Trump's demeaning of Priebus came through in other ways, too. At one point, during a meeting in the Oval Office, a fly began buzzing overhead, distracting the president. As the fly continued to circle, Trump summoned his chief of staff and tasked him with killing the insect, according to someone familiar with the incident. (The West Wing has a regular fly problem.)" "North Korea test-fired an intercontinental ballistic missile more advanced than the one fired earlier this month, underscoring Pyongyang's rapid gains in technology and intensifying a standoff with Washington." Why it matters: "The new missile would be able to fly more than 6,400 miles ... That would put Los Angeles, Denver and Chicago within range." "Senator John McCain turns around and walks back to his chamber desk, all alone." Watch it; will give you chills. "One called him an 'embarrassment.'" Axios Sourced, our video series ... Axios editor David Lawler (on the heels of his TV debut this week) and our video geniuses take a drone to the diplomatic compound in Maryland that Russia and the U.S. are fighting over. Flashback ... Check out our Axios Sourced with Jonathan Swan, "Mooch vs. Reince." 7. Trump in his own words: "Don't be too nice"
"Like when you guys put somebody in the car and you're protecting their head, you know, the way you put their hand over? Like, don't hit their head and they've just killed somebody — don't hit their head! I said: 'You can take the hand away, OK?' (Laughter and applause.)" 8. David Bradley to staff: "Not My Everyday Memo"
"David G. Bradley, the chairman and owner of Atlantic Media, is ... selling a majority stake in The Atlantic to Emerson Collective, an organization led by philanthropist and investor Laurene Powell Jobs," The Atlantic's Gillian White writes. "Bradley will retain a minority stake in The Atlantic and will continue as chairman and operating partner for at least three to five years. ... Emerson Collective will most likely assume full ownership of The Atlantic within five years." Why it matters, from Axios' Sara Fischer: "The Atlantic, which was in the red for 10 years, now draws profit of over $10 million. Powell Jobs has been investing in digital media startups, reinforcing a trend of Silicon Valley powerhouses investing in East Coast media startups." WashPost front page: Emerson Collective "is taking control of a 160-year-old publication respected for its writing on ideas and politics. ... Atlantic Media has endured a rough road, largely because of the digital revolution. Bradley has said he has lost more than $100 million over the past decade." Disclosure: Both parties — Laurene Powell Jobs and Emerson Collective, and David and Katherine Bradley — are investors in Axios. "Twitter: No Relief in Sight," by Barron's senior editor Jack Hough: "Shares soared past $70 after the IPO. Last week they fell below $17 and may be on the way to a hat size." "I love all genres, but the songs I'm always drawn to are ones that make you feel something: songs that make you think of a memory, or a person, or a time and place. I think that's the coolest part of music, the fact that the same song can incite different emotions in different people."